PE Hard Material Washing Line is mainly used to crush, wash and dry the waste PE materials. We can professionally design the recycling line according to customers’ waste plastic material. The capacity can be 500kg per hour. PE Hard Material Washing Line is basically consist of belt conveyer, crusher, steam washer, scrubbing washing unit, rinsing and precipitation washing unit, centrifugal dewatering unit, hot air flow drying unit, and electric control cabinet. Regarding PE bottle recycling, one of the main application is surely blow molding application, as this became for the investors one of the most important final applications in terms of investment returns and of positive results.the most common applications of PE bottle are milk and food containers, detergent bottles, body care as shampoo bottles, and motor oil bottles. PE is also used for PET bottle caps. 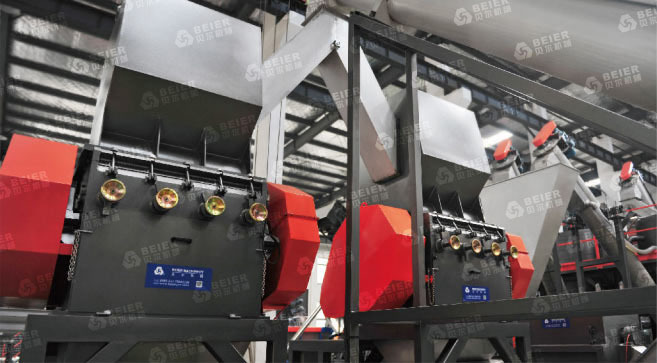 In this hard material section, Beier Machinery can process PE recyclable products like PE post consumered containers, pipes, other blow molding applications. Beier machinery PE hard material washing line is consisting in sorting prewashing, wet grinding, hot washing, separation, centrifugation and drying. then it can be conveied to Beier Machinery pelletizing system for further recycling process.